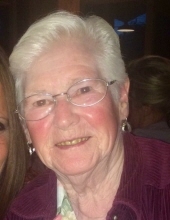 Kennebunk-Marlene Green Nichols, 86, died peacefully on January 15, 2019, surrounded by her loving family in Biddeford. She was born on September 4, 1932, in Houlton, Maine, a daughter of Virgil and Evelyn (Collins) Green. She graduated from Kennebunk High School with the class of 1951. Marlene married her high school sweetheart, David Nichols, on December 29, 1951, sharing 61 wonderful years together. Marlene was employed by York County Community Action for many years working in various capacities. She began in Kennebunk as a school bus driver and cook. Later she took college classes earning her teaching certificate, working in both the Sanford and North Berwick Head Start program. She took care of many children in her home and each one was very special to her. Mom loved and cherished her family. She was devoted to the Lord, faithfully reading her Bible daily. She enjoyed camping and fishing at Frost Pond Camps in Northern Maine. She loved her flower gardens. She enjoyed going out to coffee, shopping and attending local craft shows with her sisters. Tuesday night Bible study in Gerry’s home was a highlight. She also loved going over to her daughter’s daycare; all the children loved her and called her Grammie. Marlene loved Bethel Christian Church and was a member for 47 years. She taught Sunday School, played her trumpet in the orchestra and made weekly snacks for the youth group. She served as the missionary secretary/treasurer for 43 years and was recently honored with a plaque for her dedication. She had a very sweet spirit and was a loving wife, mother, grandmother, great grandmother, sister and aunt. She is survived by her three children: Stephen Nichols and wife Diane of China, Glenn Nichols and wife Rachel of Pittsfield and Ann (Nichols) Beaulieu and husband Jim of Biddeford; 5 grandchildren; Stephen Nichols Jr. and wife Kelly, Kevin Nichols and wife Niaomi, Mikaela Nichols, Caitlin Etheard and husband, Ritchnel and Jillian Beaulieu; great grandchildren, Corry, Riley, Reese, Korrine, Garrett, Ashley, Austin and Marcus; and one great great grandchild, Kailee; two sisters, Myrna Pierce and husband Charles of Arundel and Gerry Towne and husband Bob of Kennebunk; brother, Ronald Green of Peoria, AZ; many loved nieces, nephews and extended family. She was predeceased by her parents; her loving husband, David Nichols; brother, Harold Green; sister-in-law, Betty Green; nieces, Missy Nichols, Kerry Jane Green and Debbie Archer; nephew, Mark Towne; and a cousin, Josephine Green. The family will receive friends from 10-11 a.m., with a funeral at 11 a.m., Saturday, January 26, 2019, at the Bethel Christian Church, 129 Lower Main Street, North Berwick, with Pastor Bobby Cole officiating. A gathering will follow and all are welcome. A committal will follow at the Evergreen Cemetery, Route 35 in Kennebunk. Should friends desire memorial contributions may be made to the Missionary Fund at Bethel Christian Church, PO Box 537, North Berwick, Maine, 03906, in Marlene’s memory. To send flowers or a remembrance gift to the family of Marlene Green Nichols, please visit our Tribute Store. "Email Address" would like to share the life celebration of Marlene Green Nichols. Click on the "link" to go to share a favorite memory or leave a condolence message for the family.